In this useful book, author and physical therapist Cheryl IIov shares her years of personal experience and expertise to help readers achieve a healthy life through movement, mindset and nutrition. IIov begins the book with a candid preface about her life, including her early years as an impossibly skinny child, the discovery of ballet and Pilates, followed by debilitating chronic pain that turned her world into a nightmare but ultimately led her to seek solutions to regain her health. Section two offers chapters on specific methods for strengthening muscles and building flexibility and balance, as well as a chapter on nutrition. The final section acts as a recap, where readers can find a quick reminder about IIov’s approach and methods. Books of this nature can be difficult to do well because they have been done many, many times before, and also because so much information can quickly turn dull. But IIov has an engaging style and much to offer. Some readers, especially those who are new to the fitness world, will gain from her practical advice, such as the so-called movement lessons. And even though experienced fitness devotees will find much that is already familiar in those lessons, they will benefit from IIov’s personal experiences and the anecdotes she shares of how clients excelled or failed. 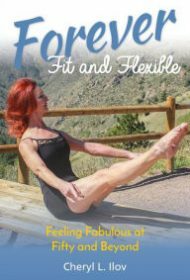 Overall, Forever Fit and Flexible is a well written, thorough guide to healthy living that will be enjoyed by a wide spectrum of readers looking for the same.